This steviapura ® quality product from the Stevia extract is derived from the Stevia rebaudiana Bertoni plant. 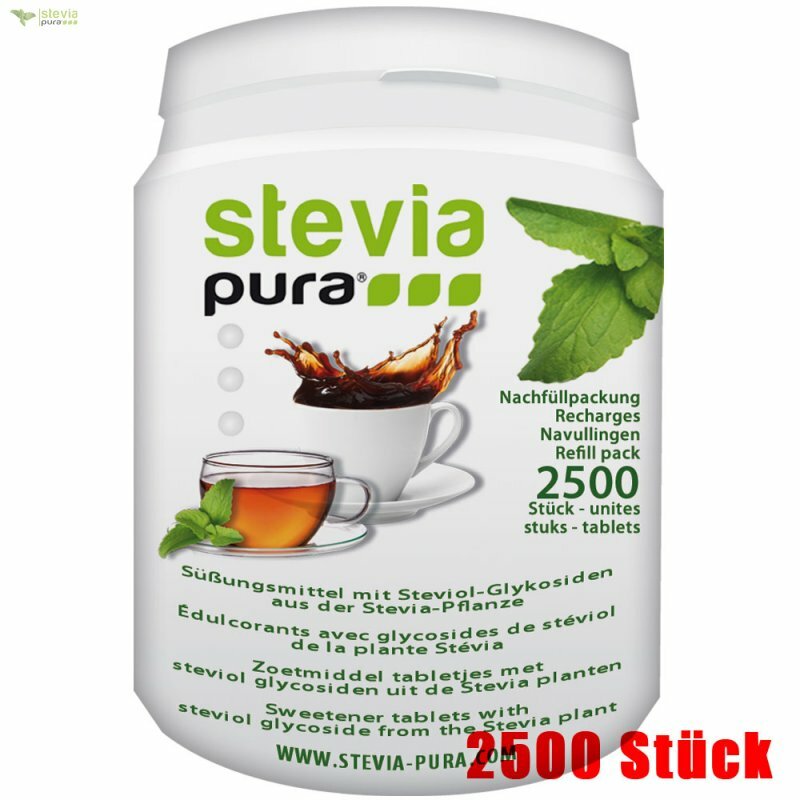 With the Stevia Tabs 2500 refill you can easily refill steviapura ® 300 Stevia Tabs - tablet dispenser or any other dispenser. Steviol Glycosides >95%,rebaudioside A, Isomalt, Sodium Carbonat, Citrat. Please note: Actual product image may vary from image displayed. 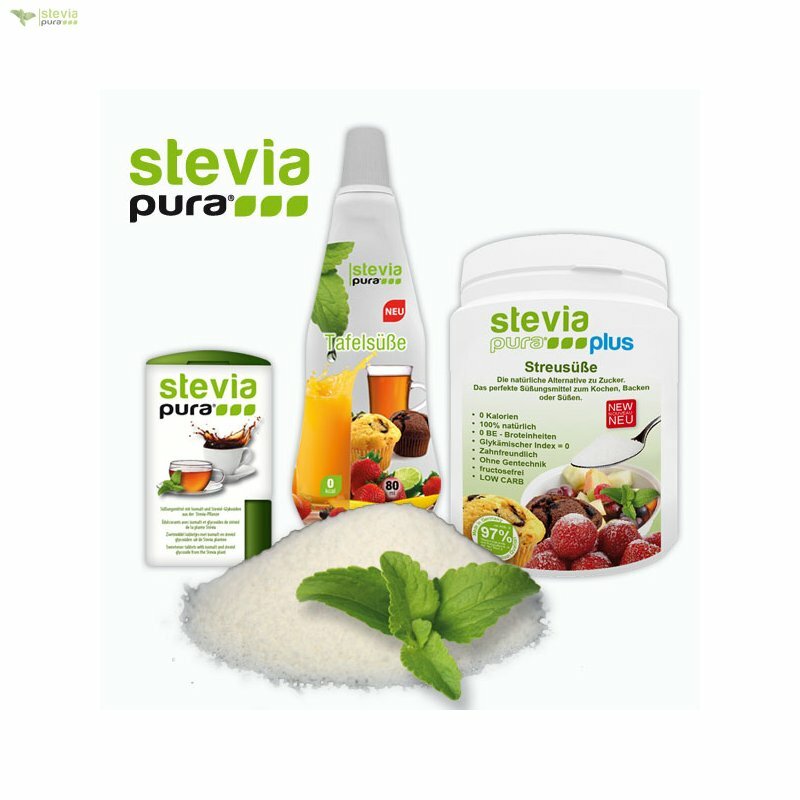 steviapura ® Stevia tablets are free of artificial sweeteners, flavors, inulin, lactose, maltodextrin, sugar and erythritol. A native plant of Paraguay, Stevia rebaudiana, also known as honey herb ka'a he'ê (Guarani) and sweet herb, sweet leaf and there used by the Guarani Indians for centuries as a medicinal and sweetener plant. The stevia plant belongs to the daisy family, Latin Asteraceae and belongs to the family of the asters. Today, Stevia rebaudiana is grown and used worldwide. The main varieties are Stevia rebaudiana Bertoni and Stevia rebaudiana Criolla. The leaves of the stevia plant contain sugar molecules called steviol glycosides or stevioside. The steviol glycosides of the stevia plant are divided into dulcoside, rebaudioside A to F and Stevioside. The rebaudioside A has the highest sweetness and the best sensory properties. It is extracted in a complex process from the Stevia leaves and is the most precious ingredient of Stevia leaves. 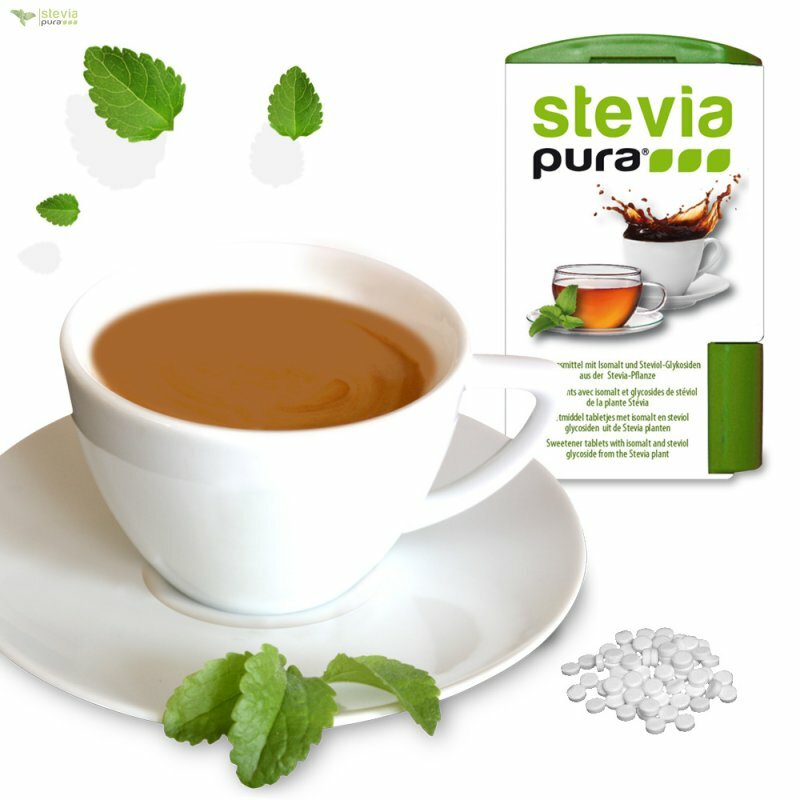 steviapura ® STEVIA GROUP products are manufactured according to GMP, HACCP and ISO 22000 guidelines. steviapura ® raw materials are tested for microbiological purity and pollution. The limits of pesticide residues in leaves of the Stevia Stevia GROUP will be adhered to the guidelines of the European Pharmacopoeia. Copyright © 2014 Stevia Group I All rights reserved. | Steviapura ® is a registered trademark of Stevia Group. * Richtwert basierend auf einer Ernährung von 2000kcal Tageszufuhr eines durchschnittlichen Erwachsenen. 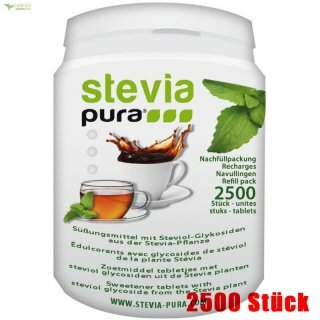 steviapura® Stevia Tabs sind frei von künstlichen Süßstoffen, Aromastoffen, Dextrose, Fruktose, Laktose, Maltodextrin oder Zucker. Besonders im Früchte-, Kräuter- aber auch im Schwarz-Tee entwickelt unsere einzigartige Stevia Rezeptur ein ausgewogenes süßes Aroma und Geschmack. Auch mit Kaffee und anderen Heiß- und Kaltgetränken harmoniert der kalorienfreie Genuss der Stevia Süße. Durch die praktischen und handlichen Minispender von steviapura® lassen sich die Stevia Tabletten einfach dosieren und sind ein idealer Begleiter für unterwegs.